PFKP antibody recognizes 6-phosphofructokinase type C, also known as 6-phosphofructokinase, platelet type, ATP-PFK, ATP-dependent 6-phosphofructokinase, platelet type, phosphofructo-1-kinase isozyme C or phosphohexokinase. Mouse anti Human PFKP antibody recognizes ATP-dependent 6-phosphofructokinase, platelet type (PFKP), also known as 6-phosphofructokinase type C, 6-phosphofructokinase, platelet type, ATP-PFK, ATP-dependent 6-phosphofructokinase, platelet type, phosphofructokinase, platelet type, phosphofructo-1-kinase isozyme C, phosphofructokinase 1 and phosphohexokinase. PFKP catalyzes the irreversible conversion of fructose-6-phosphate to fructose-1,6-bisphosphate and is a key regulatory enzyme in glycolysis. The PFKP gene, which maps to chromosome 10p, is also expressed in fibroblasts. The muscle and liver isoforms of phosphofructokinase, which map to chromosomes 12q13 and 21q22, respectively. Tetrameric phophofructokinase enzyme expressed in platelets can be composed of subunits P4, P3L, and P2L2 (Vora 1981). 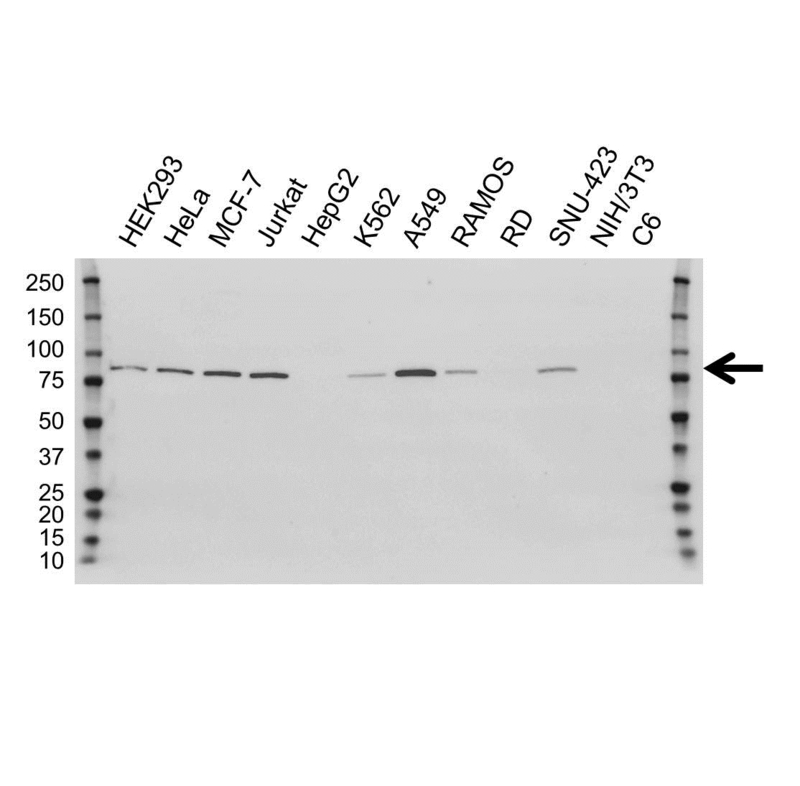 Mouse anti Human PFKP antibody detects a band of 86 kDa. The antibody has been extensively validated for western blotting using whole cell lysates. Anti PFKP detects a band of approximately 86 kDa in Jurkat cell lysates. Vora S (1981) Isozymes of human phosphofructokinase in blood cells and cultured cell lines: molecular and genetic evidence for a trigenic system.